Two years ago I made a curious observation. Despite being an avid science student for six years at school and three years at university, I had no idea what it would mean to actually be a scientist. So I decided to conduct an experiment. I became involved in two annual, international competitions for student-driven research in Synthetic Biology. One of these competitions is called iGEM – it’s kind of like an olympics for students who want to make biology easier to engineer. I started an iGEM team at the University of Sydney; interviewing my peers to form a team, finding a supervisor and labspace, securing over $44,000 in a competitive research environment and executing an 8-month research project while studying full-time. In negotiation with our supervisor, we designed a metabolic pathway that would allow genetically modified bacteria to degrade dichloroethane – a chemical pollutant in the groundwater in Botany, Sydney. We worked on our project throughout the year and presented it at MIT, Boston, alongside over 200 teams of student from around the world. This empowering educational experience spanned the full breadth of scientific work – writing grants, designing and performing experiments, and presenting your work to be judged by your peers. iGEM has an astounding variety of projects spanning biofuels, bioplastics, medicine, art, agriculture and foundational tools that enable the field. Alongside their research, each team usually engages their local community in some way – for instance, our team built an online outreach platform and a national creative-writing competition for Australian high-school students and teachers to explore Synthetic Biology. A team from Imperial College, teamed up with London’s recycling firms to identify a set of materials that cannot be recycled in current facilities, and demonstrated that they could use modified bacteria to recycle this waste into an industrially useful, biodegradable plastic. The 2012 Munich team got people talking at beer halls by brewing beer with engineered yeast expressing flavourings and anti-carcinogenic agents from other species! Through iGEM my interests and skills expanded, allowing me to become involved with an incredible team of students from UNSW, UTS and Sydney University in the first Australian BIOMOD team. BIOMOD is a similar competition to iGEM but hosted by Harvard University. The focus of the students’ research is different – it is not about rewriting genetic material inside living things, but about building new kinds of nanotechnologies inspired by the molecular machinery inside all of us. Teams have built biosensors, molecular motors, drug delivery systems and artificial enzymes. Teams have built switches analogous to those in a simple circuit-board using self-assembling molecules like DNA. 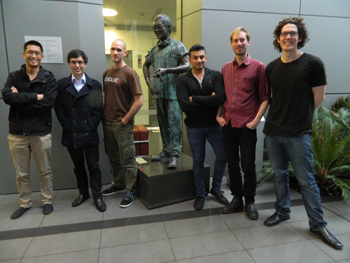 Our BIOMOD team was fortunate enough to receive generous support through the crowd-funding platform fundscience.org.au, and to bring home the Grand Prize for Overall Winners in the 2014 BIOMOD competition. The iGEM and BIOMOD competitions are opportunities for pioneering research as much as they are powerful educational tools. Our team learned far more through our project than we ever could have in class through this authentic experience of scientific work. We not only began to learn the technical and theoretical skills necessary for research, but also gained professional skills such as securing funding, working in a team and effective science communication. We have also continued to develop relationships that push this research outside our universities and around the world. The results of my experiment have been promising indeed. I have seen a group of undergraduates become a growing community of passionate scientists. I have no doubt that the recent opening of grants for Science and Engineering Student Competitions, such as iGEM and BIOMOD, will stimulate Synthetic Biology in NSW by giving students the legitimacy to leverage funding from universities and industry to support their research. Robbie Oppenheimer is an Honours student at the Victor Chang Cardiac Research Institute, Sydney. He has developed a passion for scientific research and science communication through international competitions for student research in Synthetic Biology. In October 2015 he will commence his PhD in Synthetic Biology at Oxford University.